Huskies shed so much their hair could be used to make more huskies. I deal with it everyday - because not only do I groom them in my shop, but I own a few of them as well. Thankfully, over time I've learned every trick of the trade, and I've cut down husky shedding in my home by a significant margin. And with my de-shedding treatment I have husky owners thanking me everyday for giving them some sanity back in their homes as well. Incredibly efficient at removing ​shedding hair. Every groomer I know (including me) has one of these in their shop. 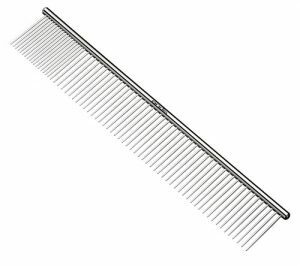 A long-pin steel comb is a perfect (and inexpensive) tool for removing deep hair that an undercoat rake can't reach. 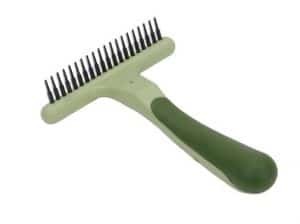 We recommend using this comb in combination with the undercoat rake. ​This will take care of that final 20% of shedding that never seems to go away - and you'll notice a difference for about 10 days afterwards. Full detailed review of ﻿each grooming tool below. ​Why Does My Husky Shed So Much? Your husky's fur coat is made up for two layers - their top layer acts as a natural protective barrier against dirt, debris, UV rays, and excessive moisture. As you may have already guessed, this layer is called the Guard Coat. Underneath they have what's called the Undercoat - this hair is softer, insulating, and used to regulate body temperature (keeping them cool in the summer, and warm in the winter). While most people brush their Husky on a regular basis, they aren't getting deep enough to brush out that undercoat (we have a perfect tool for thi﻿﻿s﻿﻿﻿). If you notice a huge increase in shedding during spring and fall, you can blame the undercoat for shedding and preparing itself for the new season. Double-coated breeds will naturally adjust the thickness of their coat based on temperature and daylight hours, therefore you can expect two big spikes in shedding every year - Spring and Fall. We call this "Blowing their Coat", and it often causes husky owners to question their own sanity. This hurricane of shedding typically lasts for 4 - 6 weeks, during which owners have to weather the storm until it's over. Thankfully, there's a few tools that can make a massive difference (deshedding treatments and brushes) ﻿which ﻿﻿﻿I'll go more into detail down below. Excessive shedding may also be the result of other health concerns that require the help of a vet to properly investigate. If heavy shedding is also accommodated by dry and flaky skin, a dull coat, and rough feeling fur, it may be the result of nutritional deficiencies, allergies, physical pain, or stress. Sudden outbursts of shedding can also be related to hormonal changes, sometimes from pregnancy or recently being neutered. Or it may be related to extreme stress or pain. Our primary defense against shedding is simply brushing, and ​the best brush for husky is the the amazing ﻿Undercoat ﻿Rake. It's simply a soft pinned rake that gets deep into your husky's coat​ and effectively brushes away trapped and dead hair. Thankfully this ​tool is very affordable and easy to use. 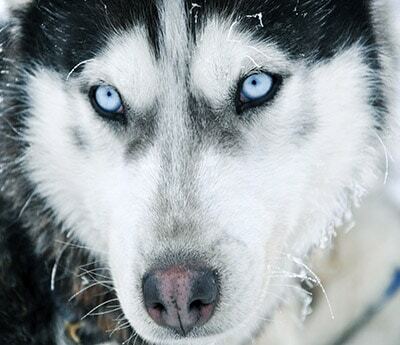 Use an undercoat rake once every 3 days, gently gliding through your husky's entire coat. Don't overdo it - dog's love the feeling of being brushed but overtime it can cause discomfort. Don't go over the same spot more than ​three times. Repeat the process in a few days. ​I don't recommend using Furminators or other similar deshedding tools on your husky. While they do indeed get a lot of hair out, these deshedding tools actually cut the cut hairs instead of brushing them out. This results in a very choppy and rough looking coat over time. 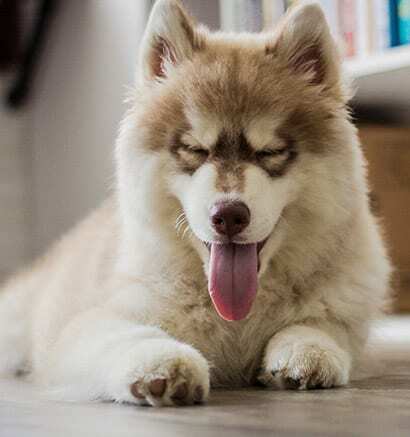 ​A slicker brush is a very effective tool for dogs that have thick coats prone to matting (such as Poodles or Shih Tzus), but not usually necessary (and not as effective) for your husky's coat. In either case I recommend you stick with the a good ​dog brush or undercoat rake instead. In order to get the most out of thick double-coated dogs, we often use a deshedding shampoo. These are full of extra conditioners and omega oils that slick the hair down and allows for easier removal. And it works! Simply bathe your dog like you normally would, while applying a generous amount of deshedding shampoo to scrub into their coat. Let the shampoo works it's magic for 5 minutes before thoroughly rinsing and drying. While they're still a bit damp, gently brush them out with an undercoat rake, and just see how much extra hair comes off, it's actually quite amazing. Many professional groomers have a h﻿﻿﻿igh-velocity dryer﻿ which blows all the loose hair off your dog in a short amount of time. Think of a leaf-blower with a hose, designed specifically to dry and remove dog hair. It's extremely effective, and reduces shedding for 2 or 3 weeks afterwards. 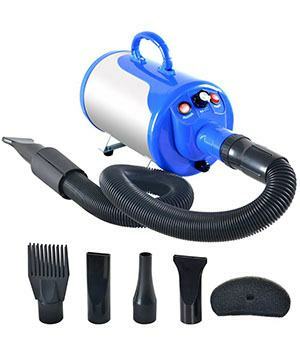 Another option is to buy your own high velocity dryer, which can save you many trips to the groomer, and be a huge life saver in terms of shedding. Check out this video I found to see just how effective it is. Found a great video on YouTube that shows just how ​awesome this works. Hop to 1:20 of the video to see it in action. Please ensure you receive proper instruction on how to properly use a high velocity dryer on a dog to avoid any possible injuries. If you're interested in getting one for yourself, ﻿﻿read more about ﻿﻿high velocity dryers﻿ and my pick of the best one for your money. Food can make all the difference. Up to 30% of your dog's daily protein requirement is used to grow and maintain hair follicles﻿, meaning that a poor diet can lead to an unhealthy (and shedding) coat. 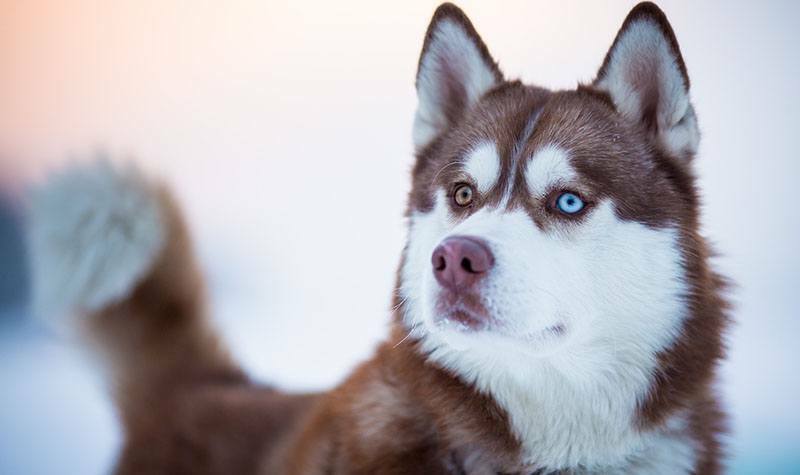 Understanding the nutritional requirements of your husky, and ensuring they receive a balanced diet of proteins and fats will help improve skin elasticity, and hair follicle strength. And not to mention, it will keep your dog feeling healthy and happy. This is the exact dog brush and tools I use everyday in my grooming shop on all double-coated breeds that come in. My goal is to make sure that dog has no shedding left in them by the time they leave (or at least cut down shedding significantly). To get into that thick undercoat you’ll need an undercoat rake, which is a soft-edged metal comb that rakes deep into their coat to remove loose hair and mats. It's a very simple tool that massively reduces shedding, and is much more effective than your typical dog brush. Also, dogs absolutely love the feeling! ​This particular one is amazing, and all the groomers at my ​shop use ​it. It's cheap, super effective​, and quite literally the best brush for huskies. ​Soft blades for comfortable grooming. 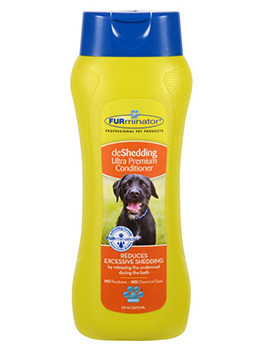 ​Very effective at getting out undercoat and reducing shedding. ​Like most tools they'll rust if left wet, make sure to dry off if using on a wet dog. ​Extra long comb for removing deep mats and debris. ​​Quick tool for finishing touches. ​These break down over time, and comb needles will bend. Thankfully, it's cheap to replace. ​​DeShedding Shampoo and Conditioner is a treatment to slick hairs with omega oils, making each hair heavier and easier to remove. It's a very effective and safe way of removing excess hair. We found that you only really need the conditioner to get the full effect, however it doesn't smell great. So if you want your dog to smell nice as well, apply a shampoo beforehand. DeShedding conditioner is an additional tool to reduce shedding, and works great if you use it along with regular brushing. This will take care of that final 20% of shedding that never seems to go away - and you'll notice a difference for about 10 days afterwards. ​If you brush your dog often then deShedding Shampoo will take care of that last remaining bit, but it won't make a huge difference on it's own. ​​Blows out coat and leaves your dog shed free for up to 3 weeks. ​​Dries coat effectively and safely. ​​Loud. All dryers are loud to some degree, and this one is no exception. Do you also recommend those tools for a wooly husky? I’m not an expert, but it seems that these recommended tools are useful for any double-coated breed. A wooly husky is still a double-coated breed like any other husky, their guard hairs are just longer than a typical husky. So, I think these tools should work just fine for a wooly husky. Good to know I will stop using my furninator brush on her! Thanks for the tips!